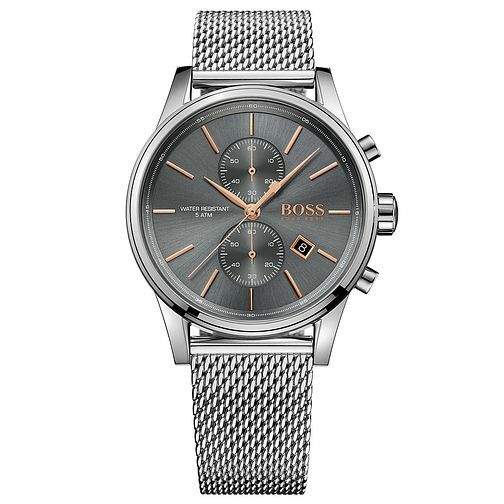 Radiating contemporary design flair, this stylish men's stainless steel mesh bracelet watch by Hugo Boss is styled with a grey dial with rose gold tone details, two sub dials and date window. Hugo Boss Jet Men's Stainless Steel Bracelet Watch is rated 5.0 out of 5 by 4. Rated 5 out of 5 by Anonymous from Gents Hugo boss watch. This gents Hugo boss watch, has style, and it came at a fantastic not to be missed price. Rated 5 out of 5 by Anonymous from Boss jet watch Fantastic watch great quality. Great price. Quick delivery and well packaged. Definitely recommend this watch and supplier.